RALEIGH, NC – If you are in need of some quick romantic ideas you are in luck. Michael Webb has literally written the book on romance and he is giving it away to any who want it. Michael Webb is an internationally known expert on romance, having written 11 books on the subject and has been on over 500 television and radio shows sharing his romantic tips and ideas. 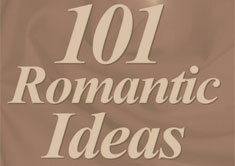 On his popular website, www.TheRomantic.com, Webb has amassed over 10,000 creative romantic tips. Some of his best ideas are in his101 Romantic Ideas ebook which he gives away as a free bonus to anyone who signs up for his free weekly romantic tips newsletter.